Well, if this isn’t one of the most pig-headed ways to protest a vegan lifestyle, I don’t know what is. When members of the vegan and vegetarian community headed out in Brighton to peacefully demonstrate all the wonderful way a plant-based diet can help the environment and prevent animal cruelty – as well as their right to chose whatever diet they so chose – one guy came up with a pretty bizarre counter-protest. 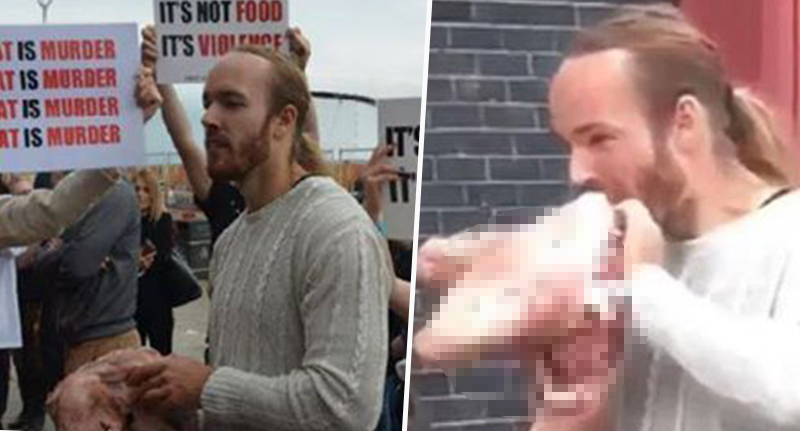 He stood outside the Brighton Centre eating a raw pig’s head during the Vegfest UK festival. Bit weird. We knew about the planned protest and were expecting 30 protesters – three turned up, which was slightly sad for them and reminiscent of a Nigel Farage march. But they proceeded to upset kids and members of the public, and with that in mind, the police arrived, gave them a warning and sent them packing. The individual, who was not named, was moved along by the authorities, but not before he had a hand in convincing some onlookers meat-eating – or at least eating the head of a pig – wasn’t for them. What was interesting was that we had meat-eating members of the public saying that this revolting spectacle had encouraged them to give up eating meat – so it seems the anti vegan protest actually encouraged people to go vegan. Just goes to show, you shouldn’t be so pig-headed with forcing others to align to your own beliefs. We live in such a speciesist society we often forget who we are eating and I think today serves as a very visual reminder of the victims behind our choices. We call ourselves an animal loving nation but our actions don’t reflect that as most people eat and wear animals every day. Over 10 million pigs are killed a year in UK slaughterhouses, they are usually killed at just five to six months old. There’s nothing just about what we do to animals and no humane way to exploit and take their lives. The pig-eater was confronted by members of the Brighton chapter of Direct Action Everywhere, an animal rights group, holding ‘It’s not food, it’s violence’ and ‘Meat is murder’ signs. Regardless of your personal persuasion, I think most of us would rather have a nice jack-fruit burger than a raw pig head?